– Heartburn pain is often worse when you laying down or bending over. Sometimes you can feel it up your throat, regurgitation and stomach ache. Heart problems can feel like heartburn, it is important to check with your doctor if increases in frequency, severe symptoms could be related to underlying causes. 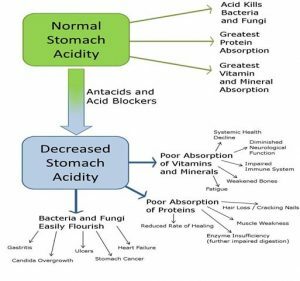 Low stomach acid can cause acid reflex, bacterial buildup, inability to kill other unhealthy bacteria, and many more problems. When this symptoms are treat with antacids, there can be a initial relief however more problems can result because they inhibit the body’s ability to produce HCL. Without the proper amount of HCL the sanitation of food is in risk. Uncontrolled yeast and bacteria can result. 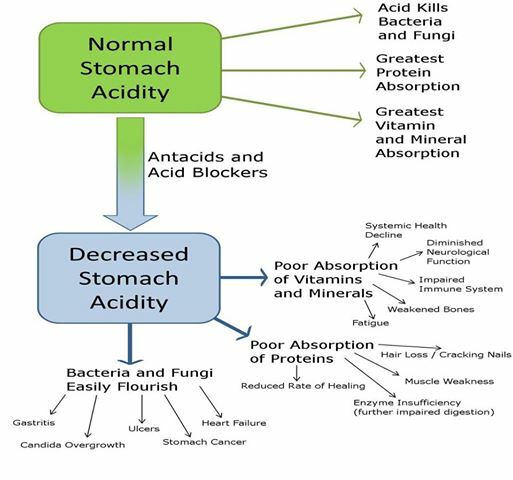 Antacids trigger the lower stomach to release more acid, requiring more antacids, this will exhaust the cells of the stomach and eventually they become unable to produce acid. Many antacids contain aluminium compounds and can cause long term calcium depletion contributing to osteoporosis. The backing of the acid reflux is acid reflux, this can be caused by many factors like low stomach acid. Contrary to what people were trained to believe indigestion is usually caused by low stomach acid. Normal acidity levels cause the esophageal sphincter to close off keeping food in its proper place. 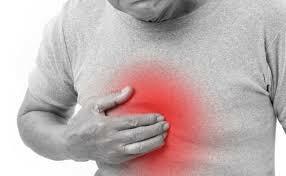 We are causing more problems by suppressing or neutralizing acid to stop heartburn symptoms. Antacids may cause a vicious cycle of heartburn problems, they are not a cure for what causes these problem in the first place. 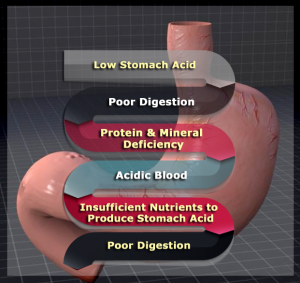 the problem with lowering the the production of HCL is that indigestion, heartburn, ulcers, may not be caused by an over-production of acid but rather by an under-production. We need to think in ways to increase the acid, have a more healthy diet , and keep the esophageal sphincter from leaking acid to the esophagus. HCL – Hydrochloric acid is an amazing digestive agent, it is critical to a good health and proper functioning of the digestive system. LEGAL DISCLAIMER – This website (including any/all site pages, blog posts, blog comments, forum, videos, audio recordings, etc.) is not intended to replace the services of a physician, nor does it constitute a doctor-patient relationship. Information is provided for informational purposes only and is not a substitute for professional medical advice. You should not use the information on this website for diagnosing or treating a medical or health condition. If you have or suspect you have an urgent medical problem, promptly contact your professional healthcare provider. Any application of the recommendations in this website is at the reader’s discretion. Sofia Reis and Fort Langley Colonics are not liable for any direct or indirect claim, loss or damage resulting from use of this website and/or any web site(s) linked to/from it. Readers should consult their own physicians concerning the recommendations in this website.